My friend had a groupon to El Ay Si, so he invited me to come have dinner with him after work. Since I’m working in Long Island City right now, I happily agreed to meeting in such a convenient spot – particularly at a restaurant I have been hearing good things about since it opened. 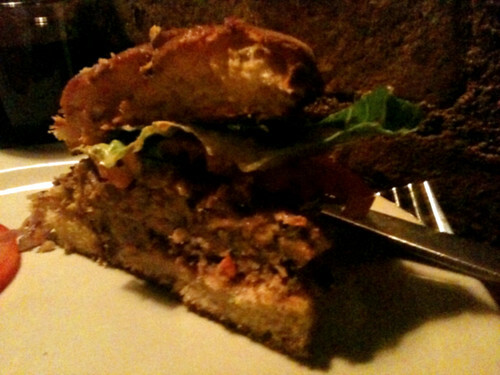 But somehow, despite having read numerous rave reviews of El Ay Si online, I had overlooked the fact that they serve a veggie burger! So I arrived at dinner armed only with my iPhone’s camera – which wouldn’t be such a problem in a brightly-lit space or in broad daylight, but we sipped drinks at the bar for awhile as we waited for a table, so the sun had set by the time we ordered our food, and the lighting in the restaurant is dim and romantic – great for a date, but not for food photography! 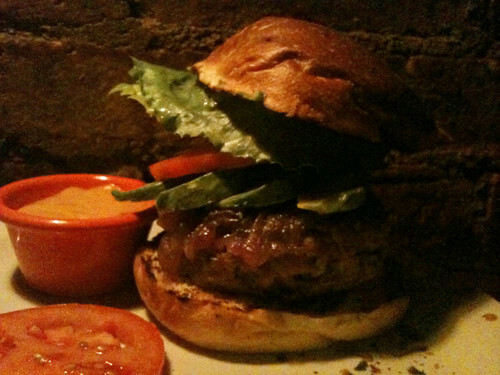 So I apologize in advance for the quality of these photos – because they definitely don’t do this burger justice. The bun was flakey and sweet, just the way I love a good burger bun. 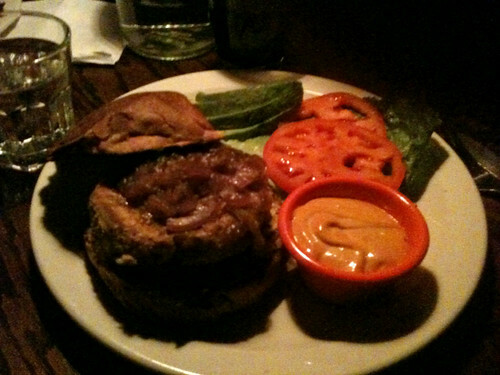 The toppings consisted of a deliciously-smokey chipotle sauce, carmelized onions, lettuce, and tomato. This is an example of a case where the bun and the toppings really make the burger – because they were both spectacular, while the burger patty itself in this instance was a little dry, and not quite up to the same level as the amazing flavors of the other components. It consisted mainly of beans, and its flavor was good, it just needed a little extra something. The waitress told me it was made with eggs, so not vegan – and she didn’t know if the bun contained dairy or not, so the lactose-intolerant should err on the side of caution here. I was so annoyed at myself for not carrying my real camera with me this day – the restaurant was beautiful, a great place for dinner (and would be an even better place for a date!). Hopefully I’ll return sometime in the future and get some better photos to share! Oooh, that looks like a hearty burger! I'm obsessed with Groupon and Living Social, btw. The photos aren't bad! Looks like a nice burger.